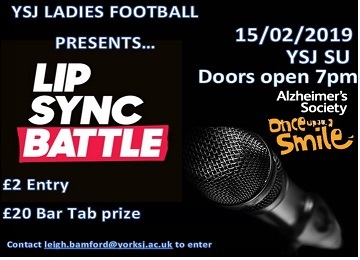 Join Ladies' Football for their annual Lip Sync Battle! This year it's in aid of the Alzheimer's Society and Once Upon a Smile, so make sure you get your best dance team ready to compete! Bring your friends to cheer you on and bring your most fabulous moves for the chance to get your hands on a £20 bar tab prize for the winning act!